Finally a movie that sets the bar for other film makers in the Haitian Movie Industry. I always knew that Tony Delerme was talented as an actor however as a director and film maker I’m not going to lie I had my doubts. Being used to the mediocre work that Haitian film makers put out in our community, I had expected to go and play with my phone the whole time while the movie was playing. However I even surprised myself for staying alert and in tuned until the end of the movie. Oh and my phone remained in my purse ….evidently so that I only took a picture during the commentaries after the movie was done. The actor selections were great, the fact that I could follow the story without skipping a beat was admirable. The facial expressions and comedic scenes were effortless. I definitely love to hate certain characters, as I felt joyful for some. Their talents really shone through! The style of editing was on point. Camera angles such as Mr. Henry going through the hallway of his house, the slow motion phases such as the party scene were perfect. The plot was easy to follow, there was no confusion on the roles of each character. Having a happy ending to the story left the audience leaving the room relieved and elated. The HD image quality was on point. The environmental scenes were well chosen. On a fashion standpoint the costumes adapted well to their characters. Because of who the characters were the makeup was done according to their skills. I’m glad Pamela’s makeup didn’t look professionally done because it really added to understanding of what social class she came from. It really made the movie that much better. Special effect makeup for example the blood coming out of Marcus’ head was believable. Kudos on that. Watch the overlap sound, the scene after leaving Mr. Henry’s grave Pamela’s crying sound should have faded and stopped entering the new scene with Marcus. I really enjoyed myself and am looking forward to many more of the same quality. Congratulations to all that were involved looking forward to your subsequent work. 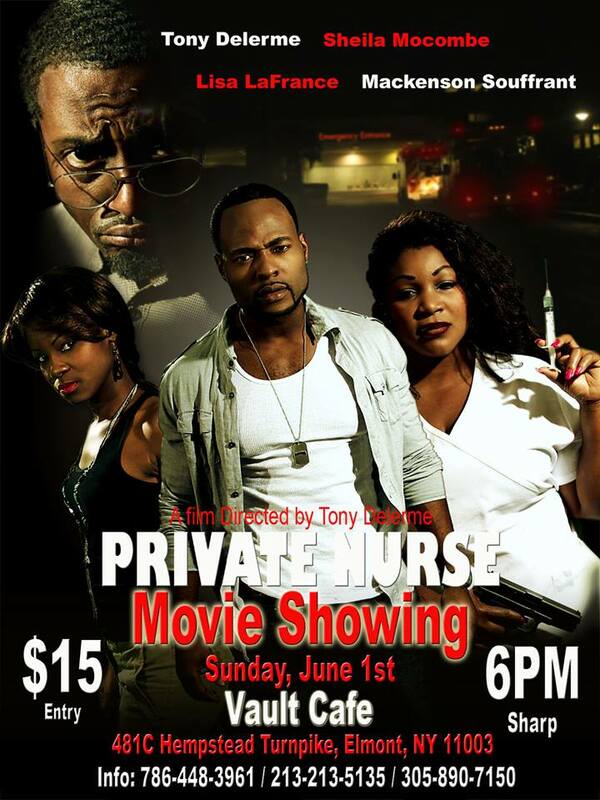 Private Nurse a film directed by Tony Delerme starring Makenson Souffrant, Sheila Mocombe, Lisa LaFrance and Tony Delerme as Mr. Henry. premiered on May 25th and available soon on DVD.